1998 Fadal VMC3016HT CNC Vertical Machining Center s/n 9810898 w/ Fadal CNC88HS Controls, 21-Station ATC, CAT-40 Taper Spindle, 10,000 RPM, 16” x39 ½” Table, Coolant. 1993 Fadal VMC4020HT mdl. 906-1 CNC Vertical Machining Center s/n 9306441 w/ Fadal CNC88 Controls, 21-Station ATC, CAT-40 Taper Spindle, 10,000 RPM, 4 th Axis Prewire (NO CONTROL BOARD), 20” x 48” Table, Coolant. 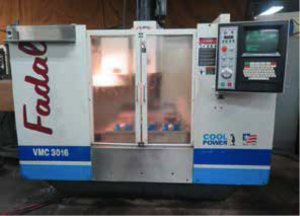 1997 Femco WNCL-35/IICB CNC Turning Center s/n L310062 w/ Fanuc 0T Controls, 12-Station Turret, Hydraulic Tailstock, 15” 3-Jaw Chuck, Chip Conveyor, Coolant. Lansing-T 20” x 62” Big Bore Gap Bed Lathe s/n CMT6280 w/ 4” Thru Spindle Bore 35-1500 RPM, Inch Threading, Tailstock, Steady Rest, Aloris Tool Post, 15” 3-Jaw Chuck, 15” 4-Jaw Chuck. Okuma Type LS 15” x 56” Geared Head Gap Bed Lathe s/n 4403-14225 w/ Newall Topaz DRO, 35-1800 RPM, Taper Attachment, Inch Threading, Tailstock, Steady Rest, 12” 3-Jaw Chuck, Coolant. Acer “Dynamic 1440G” 14” x 40” Geared Head Gap Bed Lathe w/ Newall Topaz DRO, 65-2000 RPM,Inch/mm Threading, Tailstock, Steady and Follow Rests, 5C Collet Closer, Aloris Tool Post, 8” 4-Jaw Chuck, 6” 3-Jaw Chuck. Power-Kraft 10 ½” x 32” Lathe w/ 3-Speeds, Tailstock, KDK Tool Post, 6” 3-Jaw Chuck. DiAcro mdl. 75-10 CNC 75 Ton x 10’ Hydra-Power Press Brake s/n 6750980185 w/ DRC Dynabend I Controls, 10’ Bed, 8 ¼” Throat, 102 ¾” Between Uprights, Light Curtain. Strippit Custom 30/30 30-Ton ¼” Cap Production Punch Press s/n 22722574 w/ Single and Nibble Modes, 48” x 102” Table, Fence System, 6” x 6” Corner Notcher Head, Punch Tooling. Wysong mdl. 1070 10GA x 72” Power Shear s/n P4-431 w/ Dial Back Gaging, 84” Squaring Arm, 25” Front Supports. 48” Power Roll w/ 3” Rolls, Stand. Hansford Davis Keyseater s/n 15-802 w/ 20” x 31” Table. Falls Metal Products mdl. 960 “D-Bur- R” Edge Deburring Machine s/n 121. DoAll mdl. C-305NC 12” NC Automatic Horizontal Band Saw s/n 498-94139 w/ DoAll NC Controls, Hydraulic Clamping and Feeds, Conveyors, Coolant. Kalamazoo mdl. AH9AW 9” Automatic Horizontal Band Saw s/n 11.358 w/ Hydraulic Clamping and Feeds, Conveyor, Coolant. Doringer mdl. D350 14” Miter Cold Saw s/n 21346 w/ 2-Speeds, Work Stop, Conveyors, Coolant. Grob mdl. 4V-18 18” Vertical Band Saw s/n 3150 w/ Blade Welder, 40-5000 FPM, 24 ¾” x35 ½” Table. DoAll mdl. ML 16” Vertical Band Saw w/ Blade Welder, 24” x 24” Table. Kalamazoo 14” Abrasive Cutoff Saw w/ Speed Clamping. Safety Speed Cut mdl. H-4 Panel Saw. Brown & Sharpe No. 21 6” x 18” Automatic Surface Grinder s/n 532-2- 1057 w/ Magnetic Chuck. (5) Burr King mdl. 760 2” Pedestal Belt Sanders. Apex 16” Pedestal Disc Sander. Dayton and Stanley Pedestal Grinders. Powermatic 6” Belt / 12” Disc Sander w/ Stand. Ikeda mdl. RM1300 12” Column x 36” Radial Arm Drill s/n 67190 w/ Power Column and Feeds, 18” x 21”x 16 ½” Tooling Block. Burgmaster 6-Station Turret Drill Press s/n 3327. Powermatic 2-Head Gang Drill Press w/ 240-1500 RPM. Wilton Type 24203 Geared Head Drill Press w/ 85-1460 RPM, 8-Speeds, 18” x 25” Table. Powermatic Pedestal Drill Press w/ 24” x 80” Table. Electro-Arc Tap Disintegrator w/ 15 ¾” x 17 ½” Table. (2)Lincoln Idealarc R3S-400 CV-DC Arc Welding Power Sources s/n’s AC430174, AC344591 w/ Lincoln LN-7 Wire Feeders. Lincoln Idealarc R3S-325 CV-DC Arc Welding Power Source s/n AC451288 w/ Lincoln LN-7 Wire Feeder. Wilson “Hornet” 200 Amp Welder. Acme Type 1-24- 20 20kVA x 24” Spot Welder s/n 6052. 42” x 306” Custom Welding Forming Table. (2) Smog-Hog Ceiling Mounted Industrial Air Cleaners. (9) Kurt 6” Angle-Lock Vises. Kennedy 10-Drawer Wide Tooling Cabinet. Insert Mill and Lathe Tooling, Carbide Inserts, Drills, Taps, Reamers, Endmills and Perishable Tooling. Power and Pneumatic Tools and Hand Tools. Hardware Cabinets and Hardware Carts w/ Assembly Hardware. Raw Stock Materials Including Aluminum, Stainless and Cold Roll Rounds, Thin and Thick Walled Tubing, Angle, Rectangle, Channel and Square Stock. Large Inventory of Gears, Sprockets, Bearings, Springs, Electrical, Pneumatic and Plumbing Fittings, Drive Shafts, Roller Shafts, Drive Belts, Conveyor Belts, Pneumatic Cylinders and Electric Motors. (3) Cantilever Sheet Stock Racks. Pallet Racking, Storage Shelving, Cabinets, Hardware Cabinets, Assemble Tables, Work Benches,Material and Shop Carts.